The art of theater is also an excellent method of teaching non-theatrical subjects in a creative interactive and stimulating way. 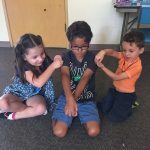 We are dedicated to creating programs that make use of the full educational potential of theater as a subject of study, an instrument for the development of life skills, and as a means of making other subjects more accessible to students. Please call us to talk about possible programs for your class or your school. We will partner with you to develop a program that specifically meets your needs. 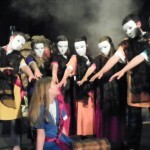 By offering professional development to schools, Youth Theatre provides effective Arts Education methodologies and tangible lesson plans that connect teacher practices to the Utah State Learning Standards. Youth Theatre also works to inspire and re-inspire teachers and to provide a comfort level with using theater and musical theater in the classroom. 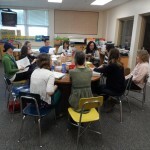 Our drama specialist works with teachers and their students to write, revise, rehearse, and perform a curriculum-based theatre script that will reinforce comprehension and motivate student learners. For groups in educational settings, a drama specialist provides consultation in directing and acting. Whether your performance is a production designed to help students meet educational goals and standards, a full-scale school play, or a theatre class or workshop, students will be coached in theater skills. Bi-weekly sessions for 10-12 weeks.